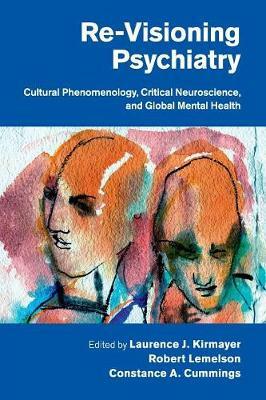 Author(s) Kirmayer, Laurence J.; Lemelson, Robert; Cummings, Constance A.
Re-Visioning Psychiatry explores new theories and models from cultural psychiatry and psychology, philosophy, neuroscience and anthropology that clarify how mental health problems emerge in specific contexts and points toward future integration of these perspectives. Taken together, the contributions point to the need for fundamental shifts in psychiatric theory and practice: • Restoring phenomenology to its rightful place in research and practice • Advancing the social and cultural neuroscience of brain-person-environment systems over time and across social contexts • Understanding how self-awareness, interpersonal interactions, and larger social processes give rise to vicious circles that constitute mental health problems • Locating efforts to help and heal within the local and global social, economic, and political contexts that influence how we frame problems and imagine solutions. In advancing ecosystemic models of mental disorders, contributors challenge reductionistic models and culture-bound perspectives and highlight possibilities for a more transdisciplinary, integrated approach to research, mental health policy, and clinical practice.